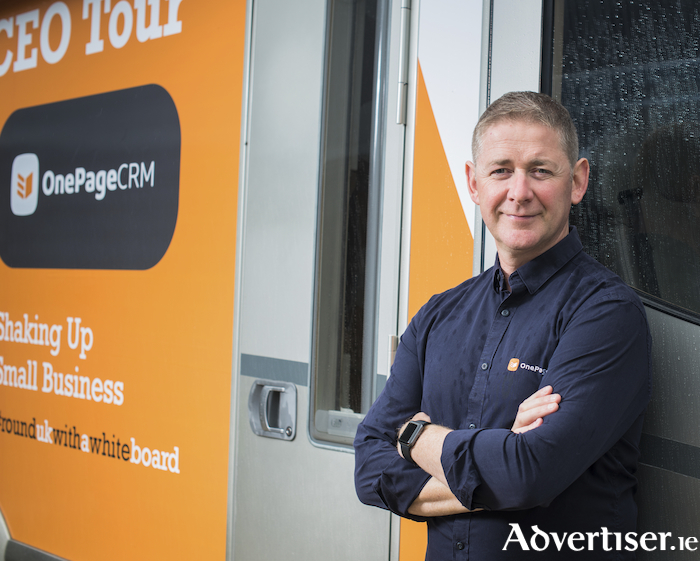 Well-known Galway businessman and inventor Michael FitzGerald, founder and CEO of OnePageCRM, is setting off on a 30-day road trip around the UK, calling on SMEs, his customers and politicians with a bold message to think global. Starting next week, Mr FitzGerald will cover the length of breadth of the UK. Famous for his problem-solving skills (on a whiteboard ), he is offering his time and expertise in return for the opportunity to learn from everyone he connects with on the route. “With a tiny domestic market of just 4.7 million, Irish entrepreneurs have to wake up thinking global — turning a perceived disadvantage into an advantage. Small businesses in the UK need to do the same now. A strong UK means a strong Ireland, and I want SMEs to lead the way, says Mr Fitzgerald. “SMEs are the oxygen of the country, and sales are the oxygen of SMEs,” says the entrepreneur whose philosophy is GTD — Getting Things Done. GTD is known for its uncluttered focus on what needs to be done next, clearing the mind for creativity, action, and progress. A natural sales and productivity master, who thinks best in front of a whiteboard, Michael is offering to apply the principles he lives and works by to an issue at hand of the SMEs he meets with. In return, he seeks an opportunity to learn from everyone he connects with along the route. His home for the next month is a Knaus C-liner motorhome — one of only two models that ever came into the UK. The other one is sandwiched between Jamiroquai’s 100+ collection of supercars. The tour’s unique hashtag, #RoundUKWitha Whiteboard, was inspired by the book Round Ireland with a Fridge by Tony Hawks, and it being said that Michael thinks best in front of a whiteboard. A NUIG graduate with an Engineering Degree, Michael has also worked as a sport science technologist to Olympic athletes, and in medical device product design, before venturing into the world of code. He went back to college to study product design and mechanical engineering and worked as a product designer for SRAM Inc. He was headhunted as an inventor for Slendertone BMR Ltd. and from there started a software company. He set up his own software business, specialising in e-Commerce systems. It was here that he was unable to find a focused sales solution to grow his client base, leading him to sketch out a design for a sales focused CRM (Customer Relationship Management ). OnePageCRM is a simple CRM for salespeople and small business. With HQ in Galway and a second office in New York, it has 10,000+ global users. Customer success is at the heart of the business with the emphasis on getting the product right, and delivering an unprecedented level of support.